Though some nihilists believe humanity is doomed, the reality is just the opposite. Though nature has always been out to kill us, science has evolved too. This book discusses the wins we have made so far and how we will defeat the diseases of the future. By Alex Berezow, Ph.D., Hank Campbell, Julianna LeMieux, Ph.D., Steve Schow, Ph.D. Featuring articles on homeopathy, energy, general quackery, regulations, social justice warriors, and herbicides. Featuring articles on agriculture, chemophobia, sustainability, labeling laws and more. By Dr. Stuart Smyth, Dr. Ralph Martin, Dr. John Dunn, Dr, Mikko Paunio, Ross Pomeroy, and Dr. Maria Trainer, plus photos from a sample of our many media appearances. June 2017. The Little Black Book of Junk Science by Alex Berezow, Ph.D.
America has been overrun by junk science, thanks to $1 billion in environmental revenue each year that relies on manufacturing new nonsense to buy new buildings, plus charlatans in supplements, alternative medicine, homeopathy and more. How many more? A whole little black book, listing them from A to Z. Well, A to Y. Why Y? Because Dr. Oz, Jeffrey Smith and Andrew Kimbrell have not managed to find something that starts with Z to raise money scaring people about. December 2016. Natural and Artificial Flavors: What's the Difference? by Josh Bloom, Ph.D.
During the last decade, it has become increasingly fashionable to tout "natural" on product labels. It isn't just fringe companies that prey on the chemophobia evident among less-informed members of the public, larger brands have also been exploiting consumers in this fashion. Yet the distinction between artificial and natural flavors is entirely manufactured. Aside from subjective taste differences, the only way to know the difference is the lack of additional chemicals natural flavors have. California has declared their intention to put warning labels on any food with "artificial" color so in this book, Dr. Josh Bloom debunks the hype. July 2016. The Name Game: How Unethical Environmental Groups and Toxic Fanatics Scare You With Words. By Josh Bloom, Ph.D.
Organic food companies, environmental groups and fame-seeking celebrities have been attempting to undermine the American public’s confidence in science by using a clever technique – telling people to fear what they cannot pronounce. This publication breaks down how benign terminology is being manipulated in such a way as to create fear and panic about common household products and ingredients. Groups promoting "chemophobia" literally seek to use the language of science against science, to scare donors into giving them money, and to promote a dishonest agenda. This book instead provides you with a way to separate science fact from environmental fiction. March 2016. Concussions: Fact v. Fiction by Nicholas Staropoli. Concussions used to be considered "part of doing business" for those who participated in sports at all levels. The idea of "shaking it off and getting back in there" was so deeply ingrained in our sports culture that it was often seen as a sign of commitment to the team. Yet during recent decades, evidence of irreversible brain injury began piling up, showing that concussions were not a relatively benign side effect of sports, but were life-altering, and sometimes fatal injuries that had been underestimated for years. February 2016. Does 'Excess' Dietary Salt Cause Cardiovascular Toxicity? By Lila Abassi, M.D. The New York State Supreme Court recently upheld a New York City law requiring restaurants to put a special label on menu items containing more than "the recommended daily allowance" for salt. This will once again lead to consumer confusion regarding how these salt allowances are created by government, what salt does in the body, and if it as toxic as some groups have claimed. The government does make maximum salt recommendations but there is scant epidemiological evidence for their numbers. There is, however, a well-known minimum level. To bring clarity to the issue, we released a consumer-level book on salt; how the body uses it, how safe levels are determined, and if it is getting a fair shake. This document analyzes their decision regarding diesel emissions and notes there were some alarming flaws in their working group selection process and a number of conflicts of interest. March 2015. Sugar Substitutes & Your Health, Revised Edition. Original by Kathleen Meister, M.S. Foods and beverages containing sugar substitutes are widely used in the United States and other countries; they offer attractive dietary options for people who are trying to limit calorie intake and/or reduce the risk of tooth decay. This report by the American Council on Science and Health summarizes the scientific facts about the safety of sugar substitutes. Extensive scientific research supports the safety of the five low-calorie sugar substitutes currently approved for use in foods and beverages in the U.S.: acesulfame-K, aspartame, neotame, saccharin, and sucralose. Increased awareness about using a highly technical process called hydraulic fracturing to recover natural gas trapped deep within the Marcellus shale has created questions about related human-health and environmental impacts. Associated arguments, both pro and con, have often been subjective, emotional and unscientific. This publication by the American Council on Science and Health is aimed at a systematic, objective review of documented types and rates of hydrofracturing-fluid-and chemical-related incidents affecting human health, to date, in the region of the Marcellus Shale Play. This consumer-friendly, Q&A brochure distils the peer-reviewed book Hydraulic Fracturing in the Marcellus Shale: Water and Health, Facts vs. Fiction, a systematic, objective review of documented types and rates of hydrofracturing-fluid-and chemical-related incidents affecting human health, to date, in the region of the Marcellus Shale Play, authored by Dr. Theodore F. Them, and the adapted, companion academic summary, Fracking and Health: facts vs. fiction. It is designed to fit in an envelope and is used as a mailer insert or educational handout. Increased awareness about using hydraulic fracturing to recover natural gas trapped deep within the Marcellus shale has created questions about related human-health and environmental impacts. This publication is a systematic, objective review of documented types and rates of hydrofracturing-fluid- and chemical-related incidents affecting human health, to date, in the region of the Marcellus Shale Play. November 2013. What's The Story? Genetically Modified Food. This consumer-friendly, Q&A brochure distils the peer-reviewed book Food and You: A Guide to Modern Agricultural Biotechnology by Martina Newell-McGloughlin, D.Sc., Bruce Chassy, Ph.D. and Gregory Conko, J.D. and is designed to fit in an envelope. It is used as a mailer insert or educational handout for people who want straight answers to complex questions about modern agricultural science, and how to react to claims by activist groups that scientists involved in food are harming the public or the planet. September 2013. Food and You: Feeding the World with Modern Agricultural Biotechnology by William P. Kucewicz and based on our book by Martina Newell-McGloughlin, D.Sc., Bruce Chassy, Ph.D. and Gregory Conko, J.D. means of raising agricultural productivity worldwide and this companion book to Food and You: A Guide to Modern Agricultural Biotechnology outlines the essential issues. July 2013. Food and You: A Guide to Modern Agricultural Biotechnology by Martina Newell-McGloughlin, D.Sc., Bruce Chassy, Ph.D. and Gregory Conko, J.D. New and innovative techniques will be required to improve the production and efficiency of the global agriculture sector to ensure an ample supply of healthy food. This challenge is confounded by the inequity between the affluent and developing countries that is likely to continue to widen. Biotechnology is one such technology that offers efficient and cost-effective means to produce a diverse array of novel, value-added traits and products but activists have leveled concerns about the long-term impact on the environment and human biology. This book separates the health scares from the health threats about modern farming. May 2012. 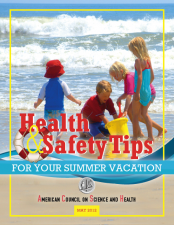 Health & Safety Tips For Your Summer Vacation by Ruth Kava, Ph.D. Whether you are traveling around the world or relaxing at home, a safe, healthy vacation will add to your enjoyment. Courtesy of Dr. Ruth Kava, Senior Fellow in Nutrition for the American Council on Science and Health, here are some health and safety tips to keep in mind when planning your summer vacation. This publication summarizes the major findings of a new review. January 2011. 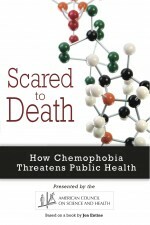 Scared to Death: How Chemophobia Threatens Public Health by Jon Entine. This academic companion paper is authored by Jon Entine, science journalist and a scholar with the American Enterprise Institute, in response to the growing level of chemophobia - the irrational fear of chemicals - among the American public. ACSH compiled this resource book and position to educate legislators, industry, media, consumers and parents on the actual risks of chemical exposure and use in everyday products. April 2008. 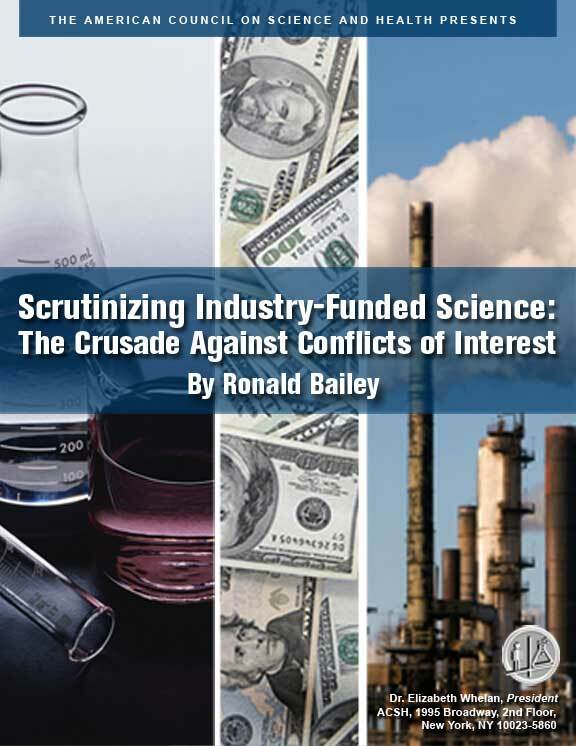 Scrutinizing Industry-Funded Science: The Crusade Against Conflicts of Interest by Ron Bailey. Conflicts of interest activists assert that ties between researchers and industry are harming patients and consumers, writes science journalist Ronald Bailey, going so far as to exclude academic researchers who have any ties whatsoever to industry from government scientific advisory boards.Yet even the activists' own flawed studies can't demonstrate that industry 'influence' is distorting the decisions made by those boards. All it does is create an "icy chill" for researchers and exclude expert input. June, 2006. 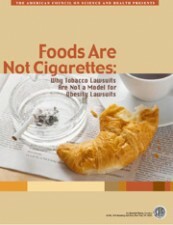 Foods Are Not Cigarettes: Why Tobacco Lawsuits Are Not A Model For Obesity Lawsuits By Kathleen Meister, M.S. Editor: Ruth Kava, Ph.D., R.D. Based on an ACSH paper by Joseph P. McMenamin, M.D., J.D. and Andrea Tiglio, Ph.D., J.D. Recently, lawyers for people with obesity and obesity-related medical problems have sued companies in the food industry. 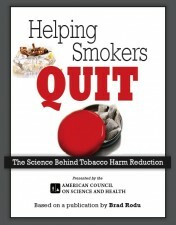 Some attorneys and activists view anti-cigarette litigation as a model that may be applicable to obesity. However, food is not tobacco, and there are important differences between the two health issues and the two forms of litigation. September 2005. 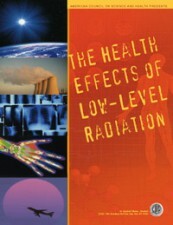 The Health Effects Of Low-Level Radiation by Kathleen Meister, M.A. The possibility of suffering adverse health effects as a result of exposure to radiation is a cause for concern and indeed, for outright fear for many people. It is often thought that little is known about the health effects of radiation and that exposure to even low doses of radiation can be disastrous; yet neither of these beliefs is true. Misconceptions about radiation and health can cause unnecessary anxiety and may even prompt some people to make unwise decisions, such as forgoing beneficial medical procedures that involve radiation. This report by the American Council on Science and Health summarizes the scientific facts about the health effects of low-level radiation. Unlike a nuclear bomb, a "dirty bomb", a dispersal designed to spread potentially harmful radioactivity, would lead to more deaths and injuries from the explosion itself, rather than the radioactive material. This book, a condensed version of Radiological Terrorism, written by Dr. P. Andrew Karam of the Rochester Institute of Technology, separates health scares from health threats about residual radioactivity based on real risk rather than the ability to detect ever-lower levels of contamination. In the post-Sept. 11 era of terrorism, the federal government has placed great emphasis on the potential threat posed by smallpox as a biological weapon. This stress on smallpox, however, raises a serious question: Are other, perhaps more serious bioterrorism agents - particularly anthrax - being given the attention they deserve? Because anthrax, in many respects, is an ideal bioweapon. July, 2000. Lead and Human Health by Daland R. Juberg, Ph.D. Despite years of intensive research, educational efforts, and remedial measures, lead continues to receive as much attention as any modern environmental health risk. Federal and state regulatory standards and programs have helped to minimize or eliminate the amount of lead in consumer products, occupational settings, and the environment; this decreased presence has contributed to remarkable reductions in BLL in the U.S. population, particularly in children. But some would still characterize lead as America's leading environmental health concern and this ACSH publication lays out the science and health concerns that remain.